Unfortunately, there is a lot of confusion about what this measurement implies in terms of how a memory foam will feel. And in reality, the density of a memory foam doesn’t alone tell you how firm or soft a memory foam is. It just tells you its weight. The firmness of a foam is measured by the ILD (the Initial Load Deflection, sometimes referred to as IFD) — and this measures how much force it takes to compress a foam a certain distance. The smaller this number, the less force needed — which means the smaller the ILD or IFD, the softer the foam. 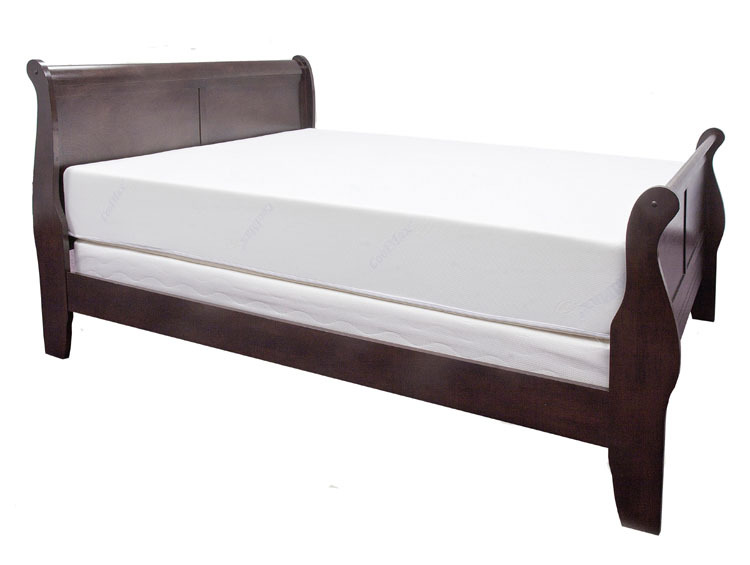 As an example, the 4 lb and 5 lb memory foams we use in our mattress both have ILDs of 12. That doesn’t mean these two memory foams have the same feel — just that they are rated the same in terms of firmness. The density does affect the feel, and if the ILDs of different density foams are equal, the higher density foam may feel firmer due to its greater density. But density alone doesn’t tell you how a foam feel. Think about stiff styrofoam used for a drink cooler. This styrofoam is low density, but very firm. While our 4 lb memory foam is much denser but much softer and squishier. A lot of the firmness in a foam comes from the chemistry of that particular foam, and I’ve seen very high density memory foam (6 lb and up) that was softer than memory foam of half that density. What density does give you an indication of is the quality of the memory foam — higher density memory foams tend to last longer since they just have more raw material in them (and less air then a comparable amount of low density memory foam). And in my experience, memory foam 3 lbs and below just doesn’t have the same soft, conforming feel that makes memory foam so comfortable. Which is why I have found over the years that 4 lb memory foam is a sweet spot — it just has the most comfortable feel and also offers great pressure relief and conforming qualities. So hopefully now you have a better understanding about what density means for a memory foam. But I don’t want you to go away thinking a memory foams density tells you everything about how that foam feels. Memory foams can have the same density, and have very different comfort ratings by customers. Because not all memory foams are created equal. Each manufacturer has their own recipe for putting together their memory foam, and while two 4 lb memory foams may have the same weight, the different recipes may give them very different characteristics — like how soft they are at room temperature, how they respond to your body’s heat and weight and conform to your body’s contours, how open the cells are (which can greatly impact on how hot a memory foam sleeps), and how well the memory foam spread pressure to reduce pressure points. You don’t get a read on any of this by simply looking at density or ILD — it is something you can only get a sense of by trying that particular memory foam. If you are in the market for a new memory foam mattress or topper, I hope you will check out some of our in-depth buyer’s guides to arm yourself with information before going out to make an expensive purchase. Click here to check out our Memory Foam Buyer’s Guide — What Memory Foam Is, Why It Works, And The 5 Key Things To Look For When Buying A Memory Foam Bed Or Topper, or if you are ready to buy a memory foam mattress, Click here to check out Our Memory Foam Mattress Buying Guide with my exclusive checklist to help make sure you get the right memory foam mattress for you at the right price. Previous Previous post: What is a Memory Foam Mattress?